You’re greeted with a Coke and a smile as you walk through the doors. This may seem like an unusual way to attract customers to a furniture store, but it has been a tradition at Grand Home Furnishings, a third generation family-run business, since 1953. The idea for the Coke came from: what is the first thing someone offers guests when they visit? Something to drink. When the chain’s store opened in Lynchburg, Virginia, back in 1953, Grand Home’s founder George Cartledge, Sr. offered Cokes to customers who came to the store’s grand opening. Nearly 10,000 people came to the store over the next three days. Grand now gives out more than one million bottles of Coca-Cola a year. A little bit of history follows. The chain’s first location was in Roanoke, Virginia, in 1911 under the name of Grand Piano Company, specializing in pianos, other musical instruments and related merchandise. During the 1930s, the company added furniture, radios and phonographs. The Cartledge family purchased the store in 1945, changing the name to the Grand Piano and Furniture Company. The chain expanded in the 1950s to other locations in southwest Virginia and eventually other states. Eventually, Grand stopped selling pianos and became Grand Home Furnishings in 1998. The Martinsburg store opened in December last year on the site of the former Bon Ton store, which had been part of the Martinsburg Mall complex. The mall, which closed in 2016, was located at 840 Foxcroft Ave.
“People in the community really wanted us here. There was just about nothing left on the site since the mall closed. People had to travel outside of the area to find places to shop. We wanted to keep things local, bring things back. We also see a tremendous potential for growth with corporations like Proctor and Gamble settling in the area,” says Cox. 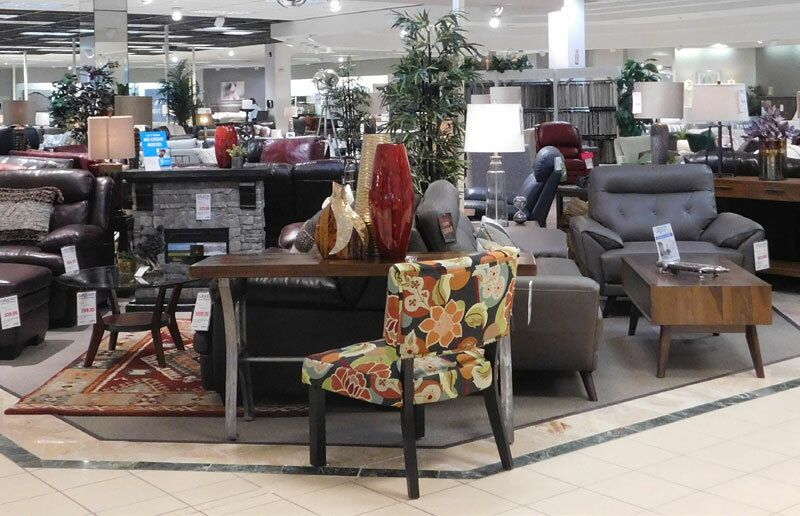 The Grand Home Furnishings store has 60,000 square feet of open space packed with furniture and a wide variety of home accessories as far as the eye can see. And customers shouldn’t just look at what’s available. They can become part of the furnishings. Literally. “We want people to sit on the furniture. Try it. Use it. See how it feels. Furniture is meant to be used. It’s okay to relax. The furniture you choose should be right for your home. People are pleasantly surprised,” says Cox. Cox says Grand will assist customers by coming to their homes to help them design a room. “We will customize your furniture. We thrive on custom ordering. Make it your own. We take great pride in our customer service. We want people to ask questions,” Cox says. Grand has a wide assortment of furniture for every room in the house. In addition, there are clocks, rugs, lamps, and rugs. Cox says popular items in the store are recliners, many of which are by La-Z-Boy. Chairs and sofas can recline. Mattresses are one of Grand’s biggest selling items. Cox says the store offers a unique system customers can try to help them decide on the mattress that is best for them. ZEEZ is a diagnostic system that analyzes a person’s sleep positions and body pressure points to determine the right mattress for how a person sleeps. “You lie down on ZEEZ for about two minutes. We also have sleep specialists available. It’s kind of like a Goldilocks test,” Cox says, smiling. The test mattress has 1,600 sensors to accurately measure body pressure points. A profile of the sleeper is taken. Do you sleep on your back, stomach, or side? Do you sleep with someone else? Some of the different positions people assume in bed can be the Armadillo, curled up in a fetal position on one’s side; the Leaper, legs spread out while resting in the middle of the bed with one foot out of the bed; the Cocoon, on the back in the middle of the bed wrapped in blankets; and the Cliffhanger, lying on the back at the far edge of the mattress with an arm and a leg out of the bed. A comfort map of a person’s body is created. The results let customers know what is the best mattress for them. The Grand Home Furnishings website even lists tips for when someone should consider getting a new mattress. The Better Sleep Council, a group consisting of bedding leaders and sleep experts who represent a cross section of members of the sleep products industry, recommends getting a new mattress once a mattress is seven years old. There are five warning signs that may say it’s time to shop for a new mattress: You consistently wake up with a sore back or neck each morning. Your mattress may be too soft; Your allergies are acting up. Too many dust particles have been trapped in your mattress; You toss and turn throughout the night. Your mattress no longer supports your body as it should; Your current mattress is beginning to sag or have lumps; and You hear a lot of creaking. Again, the mattress is sagging. No matter what a customer needs furniture-wise, Cox says Grand’s customer service and company culture sets it apart from other stores. “We pay attention to our customers. We have a great staff. Most of the people who work for the company have remained with us for a long time,” Cox says. Even though the fate of many brick and mortar stores has not been good for the past few years because of online ordering, Cox says he is confident for Grand’s future. “We have opportunities for just about everybody with a variety of payment plans. We keep up with current trends and find vendors with reasonable prices. We cater to a small town environment. We’re looking to be here for a long time,” Cox says. Grand Home Furnishings is open from 10 a.m. to 8 p.m. Monday to Friday; 10 a.m. to 6 p.m. on Saturday and noon to 5 p.m. on Sunday. For more information, go to Facebook or the website at www.grandhomefurnishings.com.